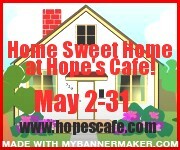 Hope's Cafe: HSH #3-Shelley's Nature Photography Review and Giveaway!! 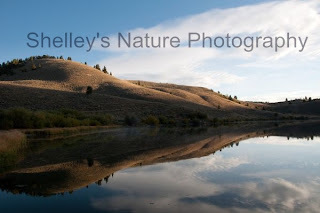 HSH #3-Shelley's Nature Photography Review and Giveaway!! "I’m Shelley Gibbins and I capture unique wildlife moments in nature! Being involved in wildlife and nature photography, I continue to be amazed at the variety of opportunites for photos of wild animals that I can find right here in Alberta; I think we often assume that we need to visit exotic places to find interesting sights, but that is definitely not the case. A lot of my nature photography comes from North America, but I have also travelled around the world taking wildlife photos in places such as Africa, Costa Rica, China, and Peru. I also enjoy birding and have a photography collection of over 430 avian species from around the world. I have a B.ED/B.A degree and have been a junior high/high school teacher for the past ten years." Shelley sent me a beautiful 11x14 matte photo for review. Dubbed Reflection, the scene is absolutely gorgeous! A peaceful lake is surrounded by hills, with what seems like miles of blue sky and fluffy white clouds overhead. This would be perfect for framing and hanging in your living room or bedroom! It would certainly make your home a very sweet place to be :) I love how Shelley captures the feel of the scene. It transports you from your living room into this absolutely stunning place of peace and beauty. 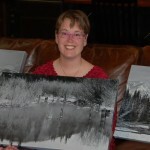 The color is off in my picture, so here is a better one from Shelley's website. The winner of this giveaway will receive an 11x14 Reflection print! Go to Shelley's Nature Photography and tell me your favorite picture! This giveaway ends Friday, May 20, 2011, at 11:59 p.m. Please leave a valid email address in each comment, as this is how the winner will be notified. Winner will have 48 hours to respond, or another winner will be chosen. Giveaway open to US residents only. Disclaimer: I was not monetarily compensated in any way for this post. All thoughts and opinions are mine. All quotes taken from the Shelley's Nature Photography website. I love the Lion Cub photo! All the landscapes are so nice, it's hard to choose among them. I like the Red Mountain print.